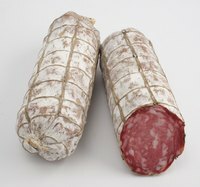 Dry-cured salami is a style of Italian sausage that, while readily available for purchase, is also simple enough to make at home. You can prepare dry-cured salami without having to cook anything; you only need to make a meat mixture and have the patience to wait two months. Dry-cured salami is also a versatile sausage; the spices suggested in the list of ingredients can be altered to suit your personal tastes. You should take care to prepare all ingredients before beginning the sausage-making. Mix the pork meat and pork fat together, dicing with a knife as you go. The smaller you can dice the meat, the better. Try not to make the pieces any larger than one-fourth of an inch. Season the diced meat and fat. You do this by mixing the meat and fat into the water, dextrose, culture, salt, pepper, nutmeg, mustard seed, sage, bay leaves, and garlic. Once mixed well, place the mixture in the freezer for half an hour. Grind the seasoned mixture. Use a 1/4-inch plate on your meat grinder so that the salami is not too thick. Stuff the ground mixture into the casings. Remember to tie up the casings. This is your salami, though at present it is not yet edible. Cure the salami. You will need a place that is about 90 F. An oven with the light on will suffice. Turn the light of the oven on and place the salami inside. Let the salami ferment for 24 hours. Age the salami. Find a place with a temperature that is constantly around 55 F. Depending on the season and where you live, this could be a refrigerator or a regular box. Check the temperature with the thermometer before deciding on a place. Once you find a suitable place, store the salami there for about two months. After two months, your salami will be ready.